Frank Smith, co-founder and director of the African-American Civil War Museum on U Street in Washington. “Those are the last words he said to me, and the next day he got killed,” Smith recalls. Though a passing comment at the time, Smith has come to live by those words. Now 74 years old, Smith doesn’t do much marching these days. 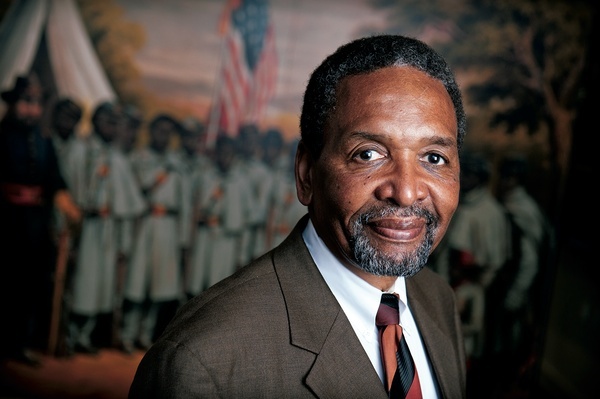 Instead, he has tried to make a difference through the African-American Civil War Museum that he co-founded in the heart of Washington’s Shaw neighborhood. He has been director since the museum opened in 1999. Sitting in his office, Smith strikes the picture of wisdom as he describes his final interaction with King, his time with the Student Nonviolent Coordinating Committee and some of the events that led to the museum’s opening. Born in Newnan, Georgia, in 1942, Smith experienced the untold difficulties faced by many African Americans. A founding member of SNCC during a short stint at Morehouse College in Atlanta, he lived the hard and fast life of grassroots organizing. After he moved to Mississippi to work as a full-time organizer for SNCC in the heat of the Civil Rights Movement, he learn about the involvement of African Americans in the Civil War. In 1962, he met a man who showed him his grandfather’s rifle and uniform. “It was the first time I had ever heard of an African American joining the Union and fighting in the Civil War,” Smith said. After that conversation, Smith began “reading about these guys and collecting books,” but did not act upon the knowledge until he completed his work with SNCC. He stayed in Mississippi organizing black voters and protests until the passing of the Civil Rights Act of 1964 and the Voting Rights Act of 1965. When Smith moved from Mississippi to Washington, D.C., in 1968, he never lost the desire for work that benefited African Americans. He simply traded his marching shoes for a different kind. After King’s death on April 4, 1968, Smith witnessed the rioting and degradation of black neighborhoods in D.C., as occurred in many cities across the United States. In the aftermath of the riots, Smith said, people started leaving urban areas, because of the economy and the lack of protection. “There was no hope,” he added. In an attempt to improve the devastated area, Smith began community organizing. Wanting to do more despite the difficulties, he ran for a position on D.C. Council and was elected in 1982. 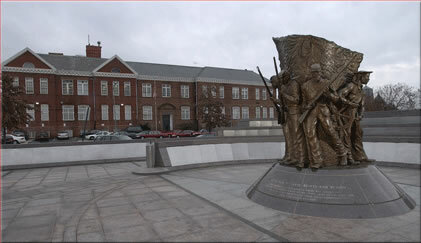 The Spirit of Freedom: African American Civil War Memorial sculpture and its Wall of Honor by artist Ed Hamilton. Seeing the opportunity to highlight the “hidden” history of African Americans, Smith researched and found the names of 209,105 soldiers that would be used for the creation of the African-American Civil War Monument. Its opening in 1998 attracted 10,000 people. The soldiers’ families donated artifacts and documentation for a museum that opened in January of 1999. Today, the mission of the African-American Civil War Museum is to educate the community while interpreting the lives of African Americans during the Civil War era. A cultural staple in the U Street area, the museum will soon be expanding. Smith, though he won’t always be around, is certain the museum’s impact will. Sydney Davenport is a journalism major at Howard University. Magazine Writing Final Video: The U St. Civil War Museum from Sydney Davenport on Vimeo.